York State Department of Environmental Conservation. spreading within 50 feet of any structure. (NYS Fire Code Sec. with us. The Code Enforcement Office and DEC will also be notified. * Small cooking and camp fires. plastics or other non-organic material. * Ceremonial or celebratory bonfires. * Disposal of a flag or religious item. * Prescribed burns performed according to state regulations. materials (such as newspaper, paper, glass and plastic) and compost your organic kitchen and garden waste. 2. What are the new regulations on open burning in New York State? * Campfires less than 3 feet in height and 4 feet in length, width or diameter are allowed. * Small cooking fires are allowed. * Fires cannot be left unattended and must be fully extinguished. * Only charcoal or clean, dry, untreated or unpainted wood can be burned. * Ceremonial or celebratory bonfires are allowed. May 14 due to the increased risk of wildfires. See Section 215.3 for a full list of exceptions. 3. Why has the DEC changed the regulations allowing open burning in New York State? single greatest cause of wildfires in New York. 4. 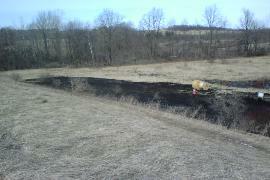 Can I burn leaves if I live in a rural area? No, burning leaves is banned in New York State. We encourage you to compost leaves. 5. Your rule says firewood must be untreated, some firewood is heat-treated, is that allowed? such as pressure-treated lumber and plywood is prohibited. 6. Are open fires allowed to control invasive plant and insect species? Yes. Case-by-case DEC approval is not required. 7. 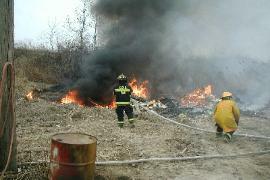 Can agricultural wastes be burned? larger than 5 acres, and the materials capable of being fully burned within 24 hours. 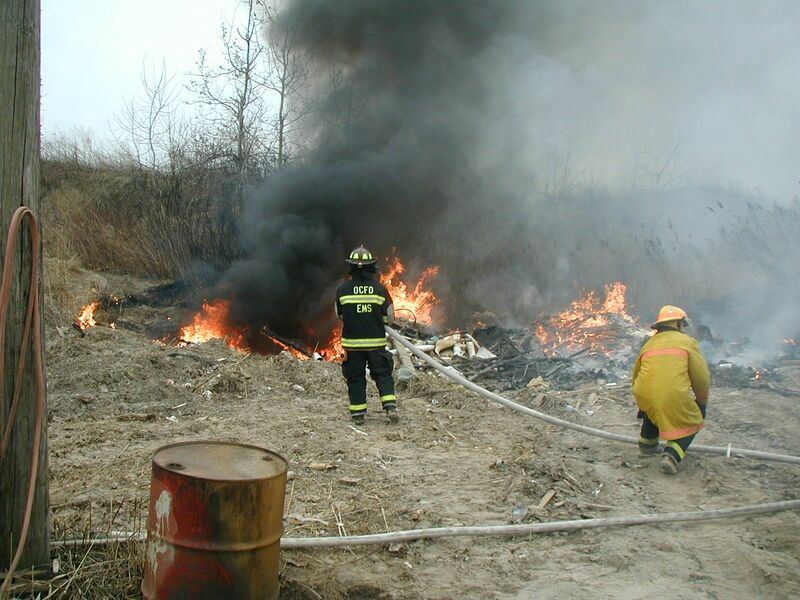 The burning of pesticides, plastics or other non-organic material is prohibited. 8. Can I burn liquid petroleum fueled smudge pots to prevent frost damage to crops? Yes. However, burning tires and other wastes for smudge is not allowed. 9. 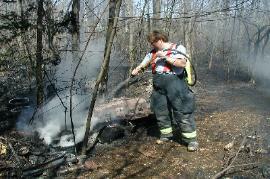 Can prescribed burns be performed? performed but only in accordance with DEC regulations. Check with your regional DEC office. 10. Are fire training burning activities allowed? Yes, with some restrictions on the use of acquired structures and in accordance with guidance from NYS Dept. 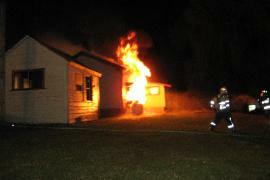 of State's Office of Fire Prevention and Control. 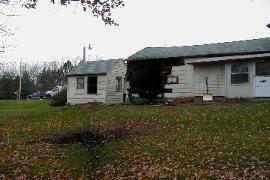 The Fire Services Bureau may be reached at 518-474-6746. 11. Are individual open fires to control plant and animal disease outbreaks allowed? Yes, as approved case-by-case by DEC, upon the request by the Commissioner of Agriculture and Markets. 12. Can I dispose of a flag or religious item in an open fire? Yes, in a small-sized fire if it is not otherwise prohibited by law or regulation. 14. Can a town prohibit open burning that the state allows? 15. Can explosives, or other dangerous contraband, be burned? Yes, on an emergency basis by police or other public safety organizations only. 16. Can brush piles be burned at transfer sites? 17. Where should I call to report an illegal open fire? To report environmental law violations call 1-800-TIPP DEC (1-800-847-7332).